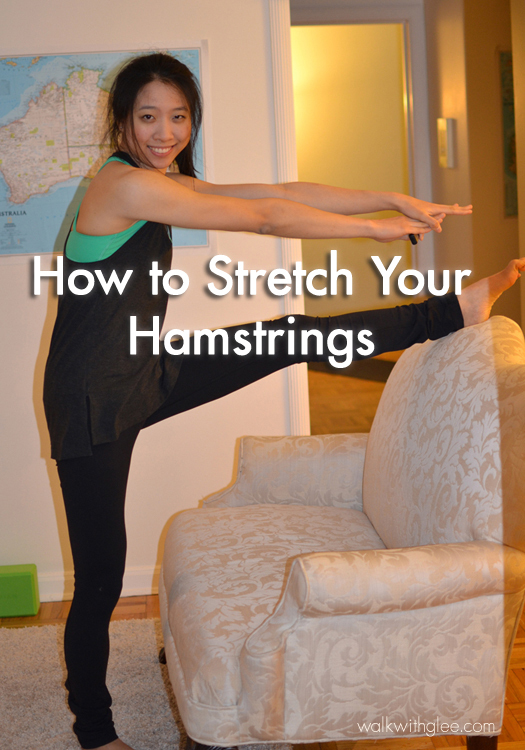 It took me over 2 weeks to develop this post, so hopefully it will help all of you learn how to properly and effectively stretch your hamstrings. I remember after starting yoga and beginning to stretch my hamstrings – a strange feeling of empty space behind my knees. This lasted for a week or so and what I didn’t realize at the time was that I had effectively loosened up my hamstring muscles so much that I could feel the difference as I walked. Your hamstrings are located behind your knees. In addition to your lower back muscles, the hamstrings and muscles attached to them are what you need to stretch if you want to touch your toes (or do well on a sit-and-reach test). Fortunately, this set of exercises, if performed daily, can help you increase your hamstring flexibility and range of motion. As a self test, try to touch your toes. You might start out like this. This is roughly how I was a couple years ago, before any yoga or stretching exercises and with no background in dance or gymnastics. The floor is so far away! If you’ve been doing some yoga, dance, or anything involving stretching, you might already have your palms flat on the ground (or if you’re blessed with naturally flexible hamstrings). Or, you might be able to touch your nose to your knee. Yes, it is definitely possible to get here no matter what age you are, but it will take a lot of dedication! My goal in this post is to show you the correct form and strategies to help deepen your stretches. So, let’s get started with the first stretch. This is the stretch that most people will recognize from gym class – when you sit down, bend one leg, extend the other, and try to touch your toes. As a side note, if the knee of your bent leg is not on the ground, no need to fret – that means you have very tight hips, and that will come in another post. When you first start out, you may find that even sitting like this and trying to reach forward will feel uncomfortable. This is where your willpower will come in handy. What you’ll want to do is use my Lessons From Contortion advice – go slowly – and know your limits to avoid pulling a muscle. Eventually, you might be able to reach a toe. Sit in pike, but flex your feet (point your toes toward you as opposed to away from you). Sit up and make sure your back is straight (a mirror helps here), then reach forward. There are a few things to keep in mind – lead with your chest and avoid arching your back. To do this, tuck in your stomach and lift your head. If you can reach past your toes, hold a yoga block in front of your feet and pull that instead. If you cannot reach your toes, wrap a stretch band around your feet and pull that instead. In these photos, I am using a SPRI Xerstretch band which has 3 loops. Your goal is to move down and forward. Again, move as slowly as you can and don’t make abrupt movements. In this stretch, lie on your back. Work one leg at a time. Extend one leg onto the floor and the other in the air. You will need to ensure that the leg in the air is straight – do not bend the knee! If you can’t reach your toes, use a stretch band as shown. In this stretch, your bottom leg might try to hover off the ground. If you have a friend to help, ask him or her to push your knee down, but most importantly, straighten the knee of the raised leg. To deepen the stretch without worrying about the bottom leg, simply bend the bottom leg and pull harder on the other leg. I use a couch in this one, but you can use a table or chair or any raised surface. Simply place your leg on a surface, straighten it, and pull on the bottom of the surface to move your body forward. Make sure you tilt your head upward! This is a great stretch for beginners because it does not require much effort to get into the proper position. Try to point your bottom leg forward (squaring your hips). Eventually, your goal is to be able to do this. Notice how my back is rounded here? This is not proper positioning. You’ll want a flat back, so tilt your head up and lead with your chest. If you raise your feet and pull forward (either with your hands or with a stretch band), you should also feel some stretch in your lower back. It can be difficult to pull yourself forward, so if you have a partner, ask him or her to gently push on your back. Be very careful and be sure to communicate with your partner to prevent any injury. Each stretch should be held for at least 30 seconds. During those 30 seconds, try to deepen your stretches ever so slightly – millimeters, even. Do these every day, preferably when your muscles are warm (be very careful stretching cold muscles). I mean, how easy is it to just prop your foot up on something and do the Surface Stretch when you’re watching TV? There are lots of other hamstring stretches out there, but these are the ones I do just about every day. The improvement you’ll make depends on your dedication to the exercise. Over the past year when I started stretching, my sit-and-reach test improved about one inch every three months. If you stick to it, you will improve. Good luck, and post any suggestions or links to other stretches in the comments!